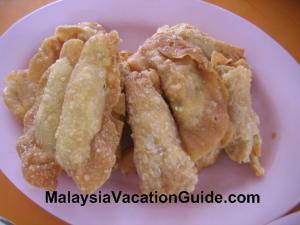 Klang is believed to have been the origin of this delicacy. 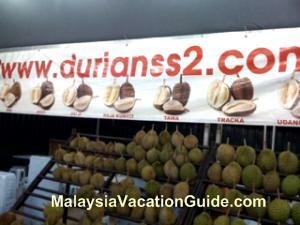 There are two to three famous restaurants located in Taman Intan, Klang. 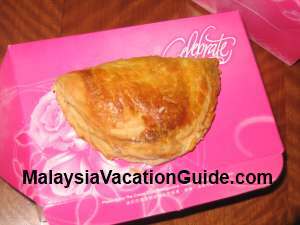 The popular ones that I have tasted include Fong Keow Restaurant, Weng Heong Restaurant and Teluk Pulai Restaurant. These shops have become so popular that many Japanese, Koreans and Taiwanese will come here whenever they are in this country. The picture of a pottery style cooking together with Yu Char Kueh and tea. 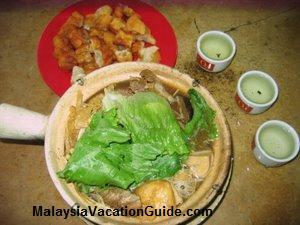 Bak Kut Teh is one of the most popular Chinese delicacy in Malaysia. 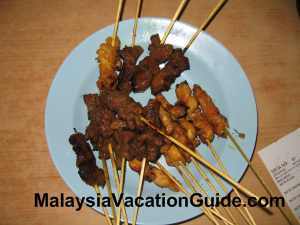 The ingredients used consist of pork ribs and herbs such as tong kui. Spices used include cinnamon, cloves, garlic and star anise. The pork ribs are boiled in the herbs for hours until the meat become tender. Other additional ingredients that are used include mushroom, lettuce and dried tofu. 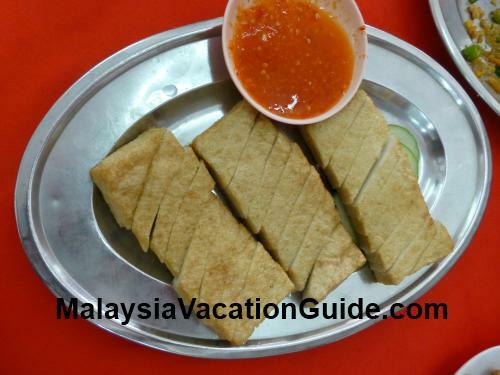 The other side dish that you can order is the fried dough (Yu Char Kueh) which is eaten by dipping the strips of dough into the soup. 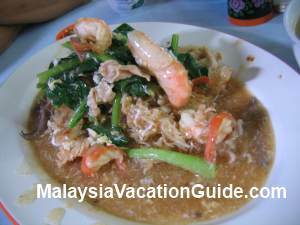 The meal is not complete without one or two vegetables dishes that are usually cooked with oyster sauce and dried onions. 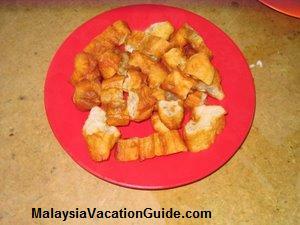 The fried dough at Fong Keow Restaurant. The common way of taking bak kut teh is always with Chinese tea and rice. The tea is believe to help dilutes the fat consumed in this pork-laden soup. Usually there are a few types of Chinese tea that you can choose from. The common ones are Jasmine Tea or Ti Kuan Yin Tea. You will have to wash the cups and fill the teapot from the many kettles that are setup near the tables. Take note that these are all non air-conditioned restaurants and your dressing can be casual when you have your meals here. Having air-conditioned environment is not practical due to the fact that gas cyclinders are used to boil the kettles. 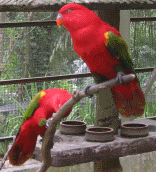 Furthermore, the Chinese prefers to take the dishes when they are hot. 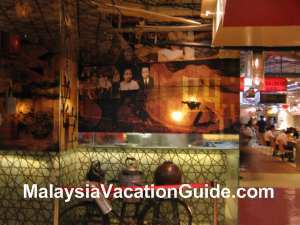 The Weng Heong Restaurant opens from 8am to 8pm daily. Fong Keow Pottery Restaurant closed at 9:30pm. Weng Heong Restaurant has moved to a new location further up the road. If you are coming from Kuala Lumpur or Petaling Jaya, go to the Federal Highway and use the Batu Tiga and Taman Rashna toll plazas. Once you have passed by Taman Rashna toll, keep to the left and follow the signage to Jalan Batu Tiga Lama. Drive along this road and turn right at the traffic light. Go straight along the road and you will pass a small bridge and turn right immediately. You will see a school to your left along this road. 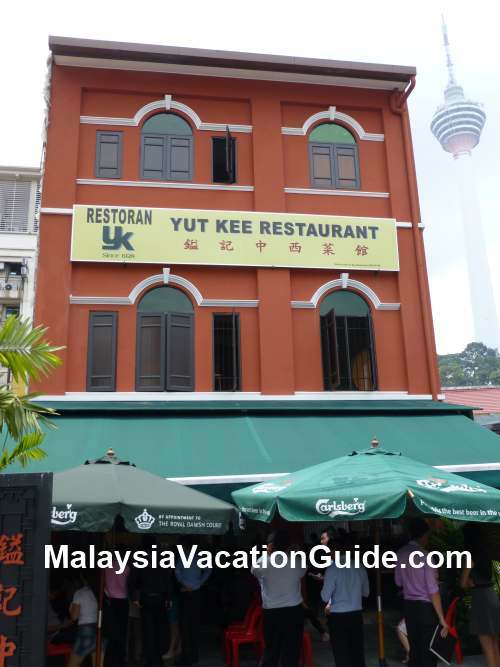 Turn right at the junction and you will see the Fong Keow restaurant. The other two restaurants are located just behind it.